Comfy Med is a family owned business, and their website guarantees both superior quality and great value for money. They’re certainly confident in this, as their homepage offers a 100% money back guarantee if you try one of their products and aren’t satisfied! They profess to be an “old fashioned” business and hold customer service as their highest priority. 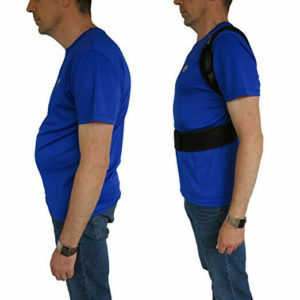 Aside from their figure-eight posture support brace, which I focus on in this review, the company offers a wide range of other medical devices. 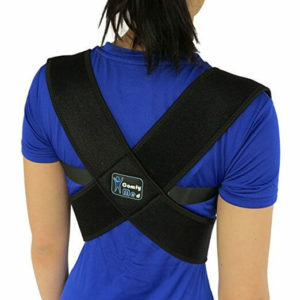 These include back braces intended for sports and breathable mesh belt-style back braces. Some of these braces come with “Easy Grip Handles” for convenience. There’s also an optional lumbar pad, which can be used with a number of their other products. They also throw in a guide to using their products, and exercises that can be performed to take care of your back. This is a nice touch. Their posture product is the Clavicle Support Brace CM-PB16. This unisex figure-eight brace is for bad posture, thoracic kyphosis, shoulder alignment, and upper back pain. The company lauds its comfort, thanks to a hybrid design which fuses being lightweight and having freedom of movement. It’s also easy to wear and adjust by yourself. Though there’s certainly been a lot of work put into the design of this product, it falls a little short on some of the promises the company gives. Read on to find out more. I put this on for the first time, deciding on a test run around the house. Straight out of the box, it seemed to have a pretty glaring design flaw. The density of the straps and the bulky adjustors on the shoulders makes it far from ideal for wearing under clothes. This immediately puts it below a range of other correctors, which are both effective and convenient for all kinds of scenarios. I was able to test the CM-PB16 by doing a few chores around the house, playing the piano, and later on eating dinner. The posture correction strength is somewhat muted with the device. Having said that, I may have ordered this brace a size too big, because when I went to tighten it, I pulled it to maximum tightness, and was unable to get rigid posture support. You can usually feel a good brace either pulling the shoulders back firmly or putting stress on the inner back muscles, but I didn’t feel that with the Comfymed. However, when I sat down, the posture support felt better. One big pro of the Comfymed is the padding around the shoulder areas, which is great for comfort. On the downside, this padding also had a tendency to bunch up under my arms. I can slouch forward with this brace. When I sat down at my desk, I could slouch easily, holding posture that could exacerbate the conditions the CM-PB16 is meant to help. After a while, the little posture support it offers seemed to become less apparent. Pretty soon, I wasn’t even aware of the pressure of the brace and wasn’t thinking about keeping good posture at all. During that time I had no posture correction. Furthermore, there are the straps. They hung down in front of me the whole time, which doesn’t have any effect on the function of the brace, but gets very annoying after some time! This could be related to the large size which I ordered. With so much extra strap length they were hanging in front of me the whole time. With nowhere convenient to tuck the straps in, this is something that users are pretty much forced to get used to. It appears that the CM-PB16 exerts most of its pressure pulling your shoulders back. Some people will prefer this method. However, in my experience, bringing the shoulders back is not how I like to correct my posture. For me, and based on research I’ve read, posture correctors that straighten posture by aligning the spine and forcing back muscles to strengthen are healthier in the long-term. As my struggle with this brace carried on, I remembered that I might have been expecting a little too much in the posture correction department. This brace is intended for other conditions, such as kyphosis, upper back pain, and clavicle fractures. So maybe it is an effective solution for those types of problems. However, when it comes to posture correction, the medium pressure and design render it a mid-range product at best. One thing the CM-PB16 certainly has going for it is a good price, so if you’re on a tight budget, and suffering from any of the conditions it’s intended for, this may be the figure-eight brace for you. However, if you’re looking for something for posture correction you are better off getting a product that’s more suited to this. In summary, the Comfy Med Clavicle Support Brace CM-PB16 may be an excellent product for people with certain conditions. However, as a plain and simple posture corrector, it leaves a lot to be desired. The padding has a tendency to get bunched up under your arms, the adjustor straps often get in the way of things, and the pressure is inadequate for anyone who has a serious desire for rigid posture.